Need a cake that's all dressed up to party? 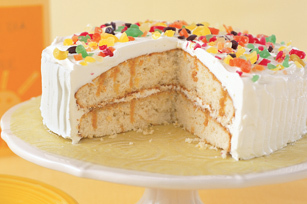 Try this caramel-soaked poke cake frosted with creamy COOL WHIP and decked out with pretty crushed candy. Prepare cake batter as directed on package; stir in nuts. Pour into 2 greased and floured 9-inch round pans. Bake 26 min. or until toothpick inserted in centers comes out clean. Cool 10 min. Remove cakes from pans. Mix sour cream and milk until blended. Stir in caramel topping. Poke holes in warm cake layers with wooden skewer. Place 1 cake layer on plate; top with half the sour cream mixture. Spread with 1/4 cup COOL WHIP; cover with remaining cake layer. Drizzle with remaining sour cream mixture. Refrigerate 1 hour. Frost top and side of cake with remaining COOL WHIP. Decorate with crushed candies. To grind nuts, blend them in a blender or food processor until finely ground. Toasting nuts adds crunch and intensifies their flavor. Oven toast at 350°F for 10 to 15 min. or until golden brown, stirring occasionally. Or, cook on the stovetop in a skillet on medium heat until golden brown, stirring frequently.